TenguLife: The curious guide to Japan: A smokeless revolution? [Update] Since first writing this post, McDonald's has now joined Starbucks in banning smoking outright in its restaurants from late 2014. Although this isn't exactly the definition of fine cuisine it is a step in the right direction. Nothing like your kids nagging at you go to Mickey D's because it doesn't smell like an old ashtray to focus the minds of the parents. Nicely done McDonald's, now, who's next? 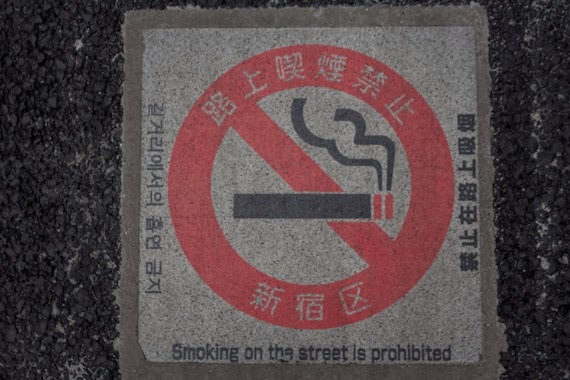 For a country that creates some of the most delicious and delicate food in the world, Japan still struggles with the concept of whether smoking should be banned in bars and restaurants. 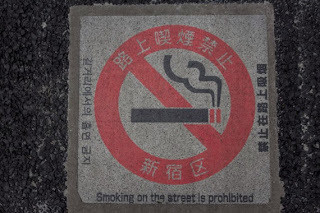 In many cities smokeless zones have been declared on streets with signs painted in the road letting everyone know where they can and cannot smoke, but inside, there seems to be no solution. Although a welcome move in the right direction for many, there remains a belief that smoking isn't harmful to health and I've even heard the argument it is positively beneficial. However, without entering into the discussion over the rights of individuals to smoke or suffer smoke, no one can argue that it makes sushi taste better to have someone light up next to you, even if you are an ardent smoker. Recently the debate reached a new level. A popular talento (TV personality) saying she would slap her boyfriend if he smoked when she was around. Although she was speaking metaphorically (though maybe not) she has ignited a debate on the subject. However, Japan is still a million miles from following many western countries and banning smoking in public completely. And ironically, as people don't socialise at home here, the economic impact to bars and restaurants would be minimal. People will still eat out, they just won't smell of stale tobacco when they wake up in the morning.